Statutes, Bylaws, House Rules, etc. The next regular meeting of the Board of Directors will be held on Wednesday February 7, 2018 at 6:00 pm in the Recreation Room. The Annual Meeting of the Association of Apartment Owners will be held on October 2, 2019, 6pm (registration begins 5:30pm) at the Lutheran Church of Honolulu, 1730 Punahou Street. Board Meetings are held on the first Wednesday of a scheduled month at 6pm. The tentative schedule of Board Meetings for 2019 is February 6, April 3, June 12 and November 6. The 2019 Annual Meeting will be on Wednesday October 2. All owners are encouraged to attend these events. This website has been created by the Board of Directors of the Association of Owners of the Punahou Royale Condominium to facilitate communication with owners and tenants. 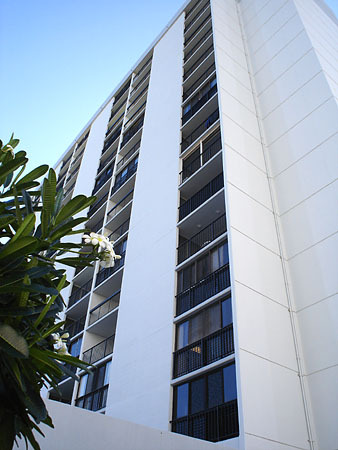 The Punahou Royale is a high-rise condominium in the Makiki district of Honolulu. The building consists of four parking levels and 14 residential floors with seven units per floor. Many documents on this site are in Adobe PDF format. To view these documents, you may need to install the free Acrobat Reader. The Board of Directors of the Association of Apartment Owners of the Punahou Royale Condominium is responsible for the content of this website. Please direct questions, comments or corrections to web@punahouroyale.com.